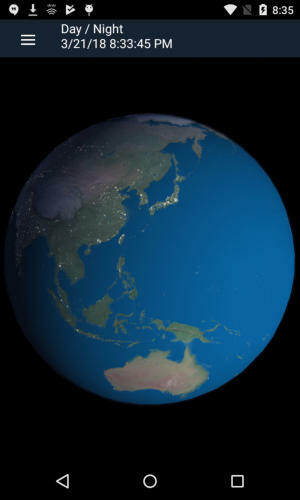 The 3D globe can be rotated and zoomed. The time displayed at the top is the current local time. 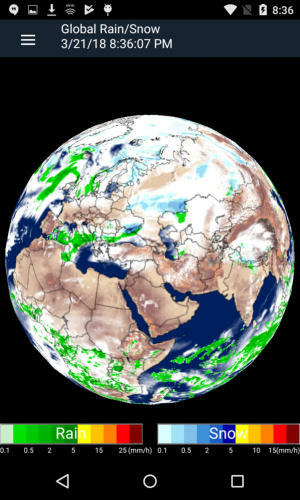 The images are updated every 3 hours, except for Rain/Snow which is updated every 6 hours. The globe can be rotated around by swiping and zoomed with pinch. menu to choose the various displays. The menu stays on the screen when the device is in landscape mode, and slides in and out when in portrait mode. 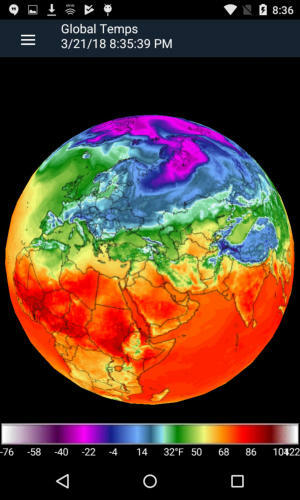 Global temperature display shows a global map with different colors for the different temperatures. At 2 meters above the ground. The legend below shows the temperature for the colors. The legend displays can be in Metric or Imperial units. This shows current rain and snowfall amounts. White areas are clouds. Shown in Millimeters per Hour or Inches per Hour. 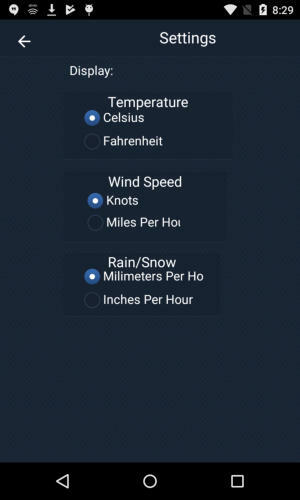 The snow level is in water equivalent - not depth. This globe shows the wind speed at 10 meters above the ground. This shows how today’s temperature compares to a past standard and will show if areas are warmer or cooler than in the past. The temperatures shown are deviations from the past climate baseline. 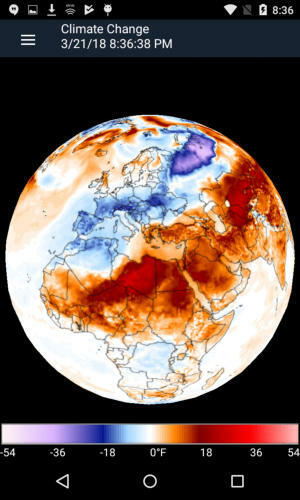 So if an area is shown as +10 degrees on the globe map, it is 10 degrees warmer than on that time of the year from the baseline. 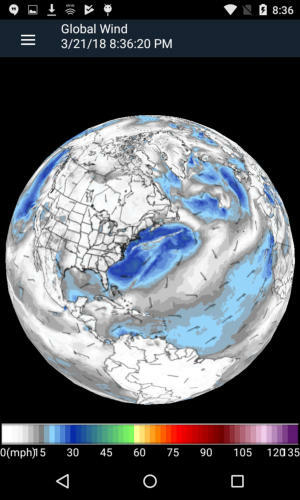 The baseline data for the past is a 1979-2000 climate baseline derived from the reanalysis of the NCEP Climate Forecast System (CFSR/CFSV2). 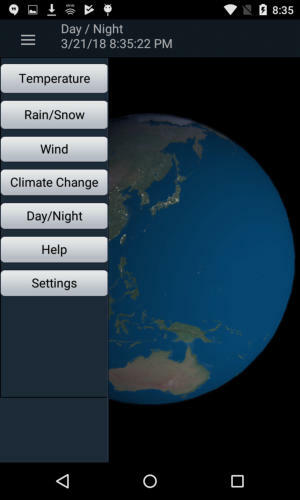 This shows the current daylight and nighttime sides of the Earth. The city lights are visible on the night side. Press the Day/Night button again when you want the sun position updated.